The screenshot above is hosted and provided by esofttools.com. Please contact them directly for any copyright infringement as we are not responsible for that content. eSoftTools Excel to Outlook converter software is relaxable tool for Import excel contacts to outlook and convert excel to outlook contacts. Free Excel spreadsheet into outlook contacts converter tool can easy to supports .xls, .xlsx and CSV file formats of Excel and helps for convert Excel to Outlook contacts of all MS Excel versions upto2019. eSoftTools Excel to Outlook PST contacts converter solution have one of best feature to automated and manual mapping facility to map contact fields. Software can generate Unicode PST file which can easy to open in any version of MS Outlook. Excel to PST Converter software can scan whole MS excel sheet contacts row and convert in to PST, MSG, vCard and other formats. 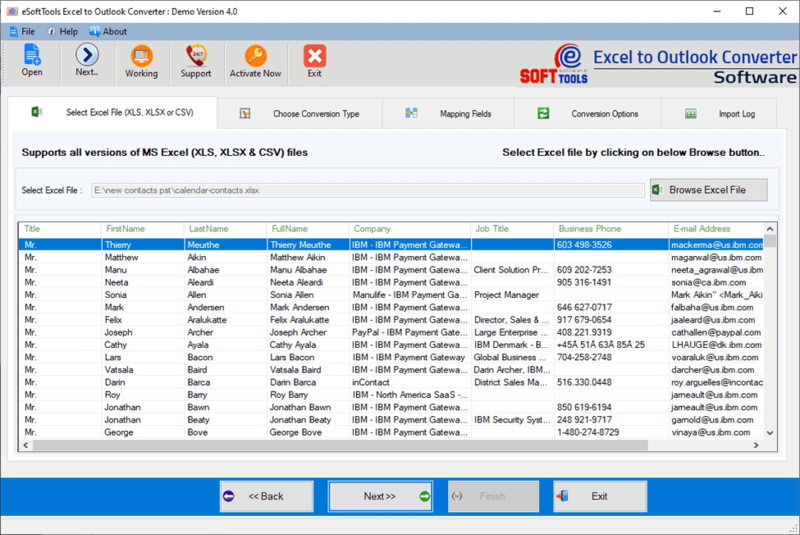 Excel to Outlook Contacts converter software can scan whole row of MS Excel contacts and import contacts from excel to outlook. Transfer excel contacts to outlook software can convert .XLS, .XLSX and CSV file formats to PST outlook. Software can export Excel to PST Outlook (PST), MSG, vCard and other formats. Software supports all MS Excel versions upto 2019. Free Excel to Outlook contacts converter software can export 10 contact items freely and if you want to export many more contacts then you can go for buy full versions software for complete features.